Why would you walk along our garden paths in this August’s heat? 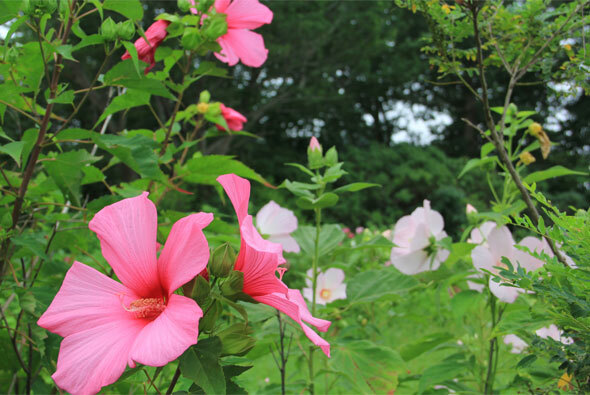 Because the gardens are so full of blooms that now’s the time to check out the plants that take the heat in stride. Visitors in the cutting garden have been commenting on the yellow sunflower-like cup plant (Silphium perfoliatum) and the burgundy burnet plant (Sanguisorba tenuifolia). These two tall perennials (8-10’) bloom reliably in the August heat. Both must be staked but add vertical drama to any garden. The garden for pollinators borders the meadow and is bursting with flowers, especially the mountain mints (Pycnanthemum muticum and Pycnanthemum virginianum). 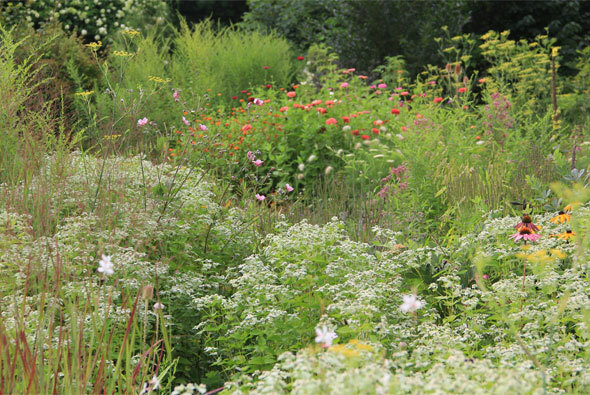 This garden is watered only when it rains and is never deadheaded to encourage seed heads for the birds. It’s an eyeful of color for visitors whose purpose is to please the wildlife ¾ a truly winning combination. Walking a little further, I reach the meadow with a classic sound of high summer: the loud chorus of cricket-like chirps that is constant from early morning to evening. But crickets sing at night. I wonder: could this loud chorus be meadow katydids or grasshoppers or something else? Far up in the trees and signaling high summer, the classic buzzing of the cicadas adds to the chorus. 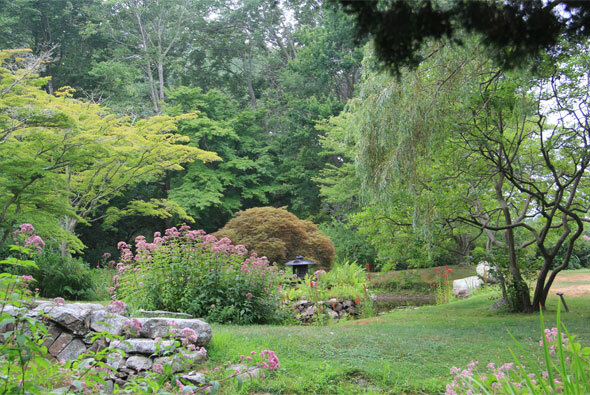 As I approach the Water Garden, dragonflies dart around, reflecting the light and relishing the water in the pond. Dozens of pink and white marshmallows (Althaea officinalis) are in full bloom in the marsh nearby, soaking up the sun. This area borders the bay and its cooling sea breezes make it easy to forget all about the heat. Come discover for yourself which garden plants take the heat in stride. 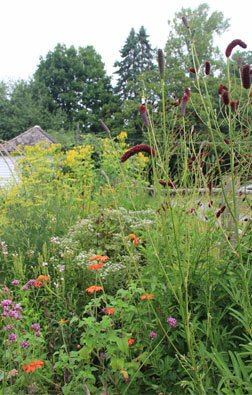 Click here to see Gail’s video of pollinators on the Meadow Path.